From virtual “save the date” cards to elaborate invitations, couples use multiple channels to communicate with guests. Valerie Marini, owner of The Paper Perfectionist on the North Shore, worked with a bride who is a professional illustrator to create this lovebird invitation design. Modern couples are going digital with their wedding planning, and upping their expectations even when sticking with the more traditional paper route for invitations and other correspondence. From budget-tracking apps to bespoke websites to customized hashtags for the big day, more than 80 percent of wedding preparation now takes place online, according to WeddingWire’s 2018 national survey. That same survey lists Boston as the second-most-expensive city in which to get hitched (at $37,000) and puts the national average cost of invitations and stationery at $560. The logical next step to save money — and the environment — would seem to be digital invitations, but most brides and grooms still opt for paper. The rest of the “stationery suite” is fair game for digital experts, however. For example, more than a third of couples married in 2017 sent electronic “save the date” messages, according to WeddingWire. 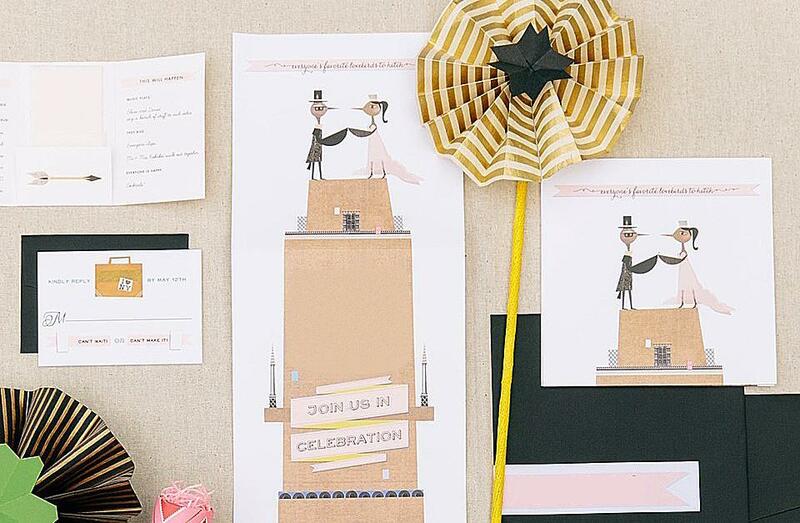 Services like Greenvelope, a Seattle-based electronic invitations company, let couples create elaborate designs and spend considerably less than they would on producing and mailing 3-D cards. Greenvelope saw sales climb by a quarter between 2017 and 2018. Stephanie Wai of Paperless Post, which began offering wedding designs in 2013, says the company’s customers like the ease of digital invites. “You can customize and share invitations with just a few clicks and track whether guests have received, opened, and RSVP’d on your phone or desktop,” she says. Virtual bells and whistles only go so far when it comes to invitations, though. “My belief is that if someone is going to the expense of planning a nice wedding, they won’t want to do a digital invitation,” says Rob Charlton, owner of Goosefish Press, a letterpress studio in Boston’s South End that uses a century-old printing press. Boston invitation designer Emily Gallardo agrees. “Nothing beats receiving a hand-addressed, stamped, and hand-canceled invitation in the mail for setting a romantic tone,” she says. Couples who do choose printed invitations use them to showcase their creativity and individuality. Lots of couples, she says, “are wanting little pieces of art to send to their guests” — from cyclists who wanted bike gears on their invitations to dinosaur enthusiasts who featured a T-rex toasting them with a couple of beers. Working with another bride who is also a professional illustrator, Marini created a massive piece that folded down to fit in an envelope. “When opened, it revealed a beautiful New York skyscraper with a pair of lovebirds standing on top, asking the guest to join them,” she says. Amanda Rose is a writer in Somerville. Send comments to magazine@globe.com.